Only joint applications, submitted either by the international researcher or by the hosting institute of the UoC. Between the last stay of the alumnus/a at UoC and the application a retention period of at least three months is required. Between a previous stay of the alumnus/a at the UoC supported by Albert's Researcher Reunion Grant and a new application a retention period of at least twelve months is required. Applicants should hold a position in a University, Research Institute, or Institution of Higher Education outside of Germany and should not reside in Germany. Applicants must join Albert’s Global Researcher Network. Applications have to be submitted in conjunction with a senior researcher of the UoC (contracted Postdoc-Researcher, or Professor) and need to be accompanied by a letter of application from the potential hosting institute at the UoC. See the check list below for details. Preference will be given to those applications which are submitted with a view to renew or built a sustainable research cooperation between the applicant and the host at UoC, possibly with the perspective to jointly attract third party funding. 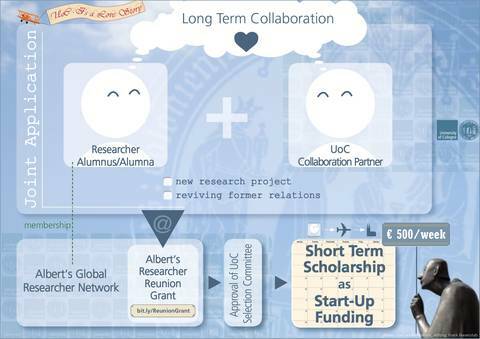 1) Albert’s Researcher Reunion Grant is designed as a start-up funding for new collaborations or as a support to revive former relations. It is therefore not available for ongoing projects. The Reunion Grant can neither be received parallel to other scholarships nor as an extension of otherwise funded projects. 2) We will confirm the receipt of your application per e-mail. If you have not heard back from us within a week after submission, please contact us to be sure your documents have arrived. 3) By submitting your application you agree to the publication of your name and basic information of your project on our website and other media including social media. The selection committee is composed of the Vice Rector for Research, the Vice Rector for International Relations and the Head of the International Office. Decisions are communicated within 4-6 weeks after the deadline. Please submit applications in German or English and only to: researcher.alumni(at)verw.uni-koeln.de. Information: Did you or do you intend to apply for other scholarships/funding for the same time period or project? When will the decisions be made? contact Dr. Johannes Müller (j.mueller verw.uni-koeln.de, Tel: +49 221 470 – 6898) for an appointment. Please save a little time (about half an hour) for this occasion, because we would like to get to know you and talk a little about your stay in Cologne.